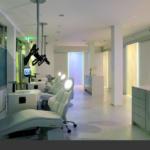 We’ve all been there—harsh lighting, outdated fitness magazines, uncomfortable chairs in windowless rooms—the truth is that dentist offices are often as ugly as they are fear-inducing. 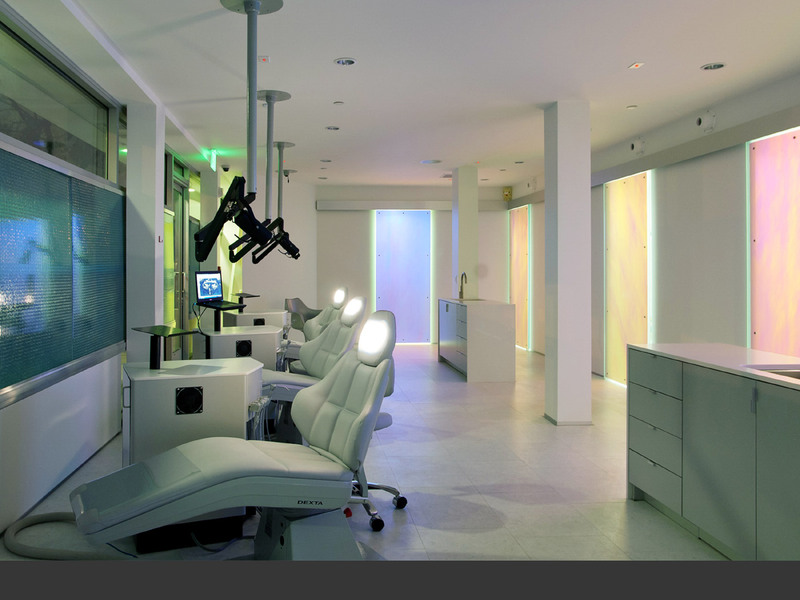 But every now and then, it’s possible to create medical offices that soothe rather than stress. 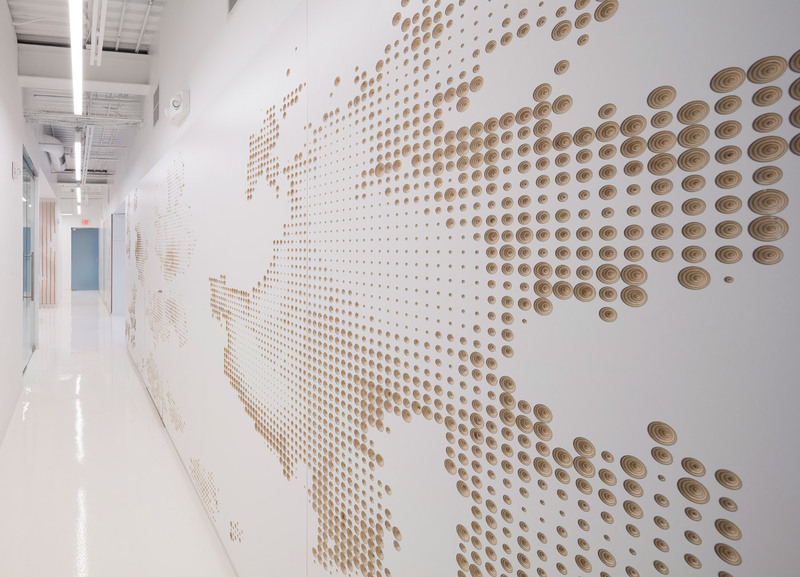 To achieve this goal, some designers might focus on interesting wall detailing, access to daylight, or even innovative circulation. 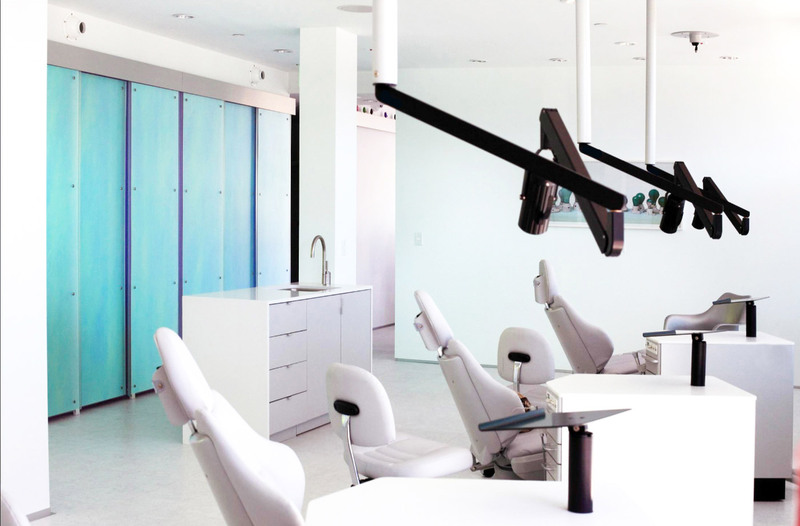 We’ve collected examples that align all three approaches to show that when designers drill down into the details of dentistry, spaces can make patients smile. 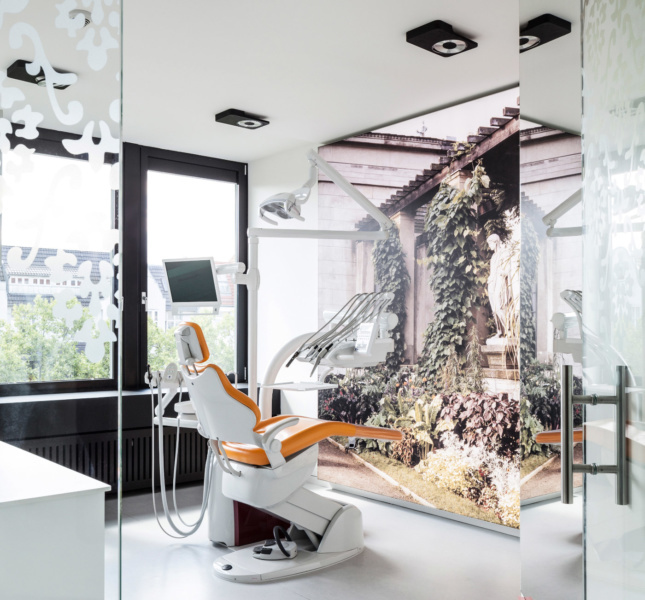 On the other side of the pond, German architects Karhard Architektur + Design divide patient rooms from circulation and waiting areas with transparency instead of the usual poché. 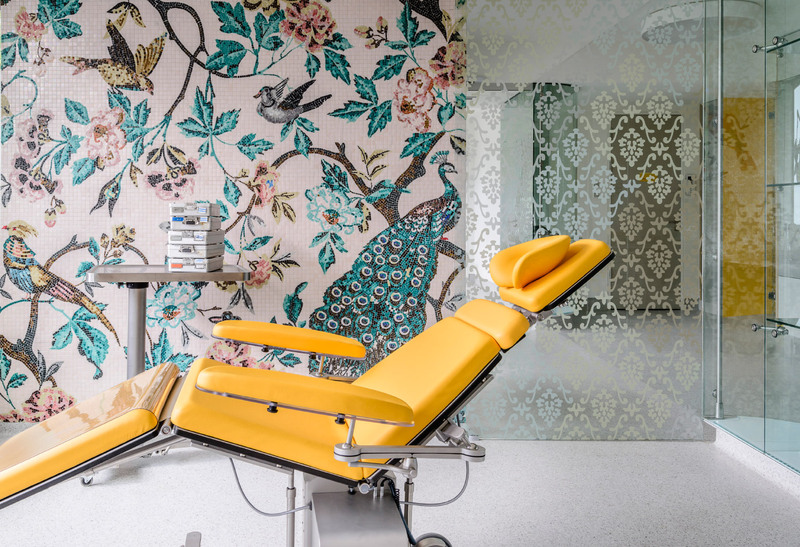 In the offices for KU64 Dental Specialists, the firm deploys fritted glass walls and brightly patterned wallpapers depicting local flora and fauna for maximum dissociation. These colorful spaces are intended to provide a visual distraction as well as personal comfort. 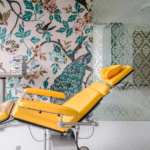 The offices include a dental surgery wing divided into sterile and nonsterile areas by a faceted airlock while also offering an area of themed recovery rooms to help patients come to. These loungelike rooms—cloaked in cross-stitched end-grain plywood, accented with photo murals depicting Baroque interiors, and filled with chrome-wrapped seating—look out over leafy, urban vistas. For Santa Monica Orthodontics in California, Los Angeles–based Sharif, Lynch: Architecture uses subtle abstraction to create surprisingly kid-friendly spaces. 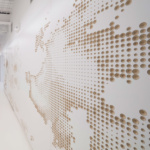 With an emphasis on “graphic flatness and tectonic fullness,” the designers interrupt cool materials with dramatic points of visual interest to bridge the front- and back-of-house sections of the office. 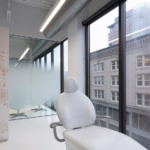 The dichotomy is most pronounced where sliding acrylic and glass panels separate an open treatment room from a mix of ancillary spaces located beyond. The prismatic, dichromatic panels change color throughout the day, running from purple to gold as the lighting conditions behind them shift. 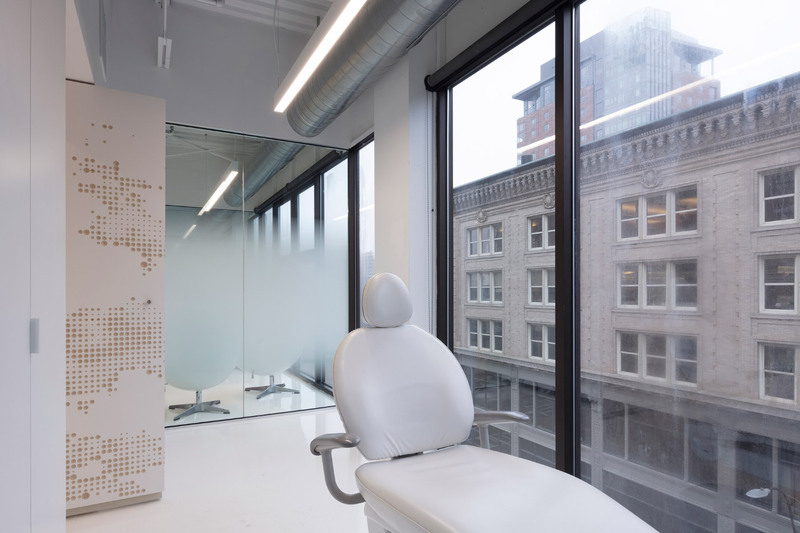 Höweler + Yoon Architecture (HYA), on the other hand, takes an opposite tack by using patterned millwork and monochromatic, faceted surfaces to conceal medical equipment and storage spaces for the MINT dental clinic in Boston. 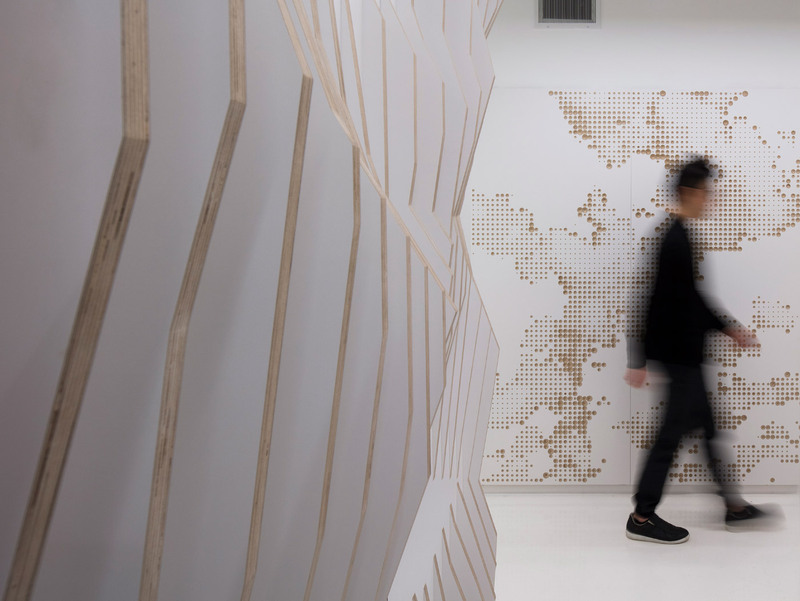 Here, the designers line an interior hallway with cabinets sheathed in CNC-milled, laminated Baltic birch plywood panels studded with pointillist representations of buoyant clouds. The arrangement, an effort to be “strategic with thickness,” according to Eric Höweler, founding principal at HYA, creates an “almost spalike appeal” to the spaces while also providing clear circulation routes as well as privacy for each of the operating suites.